Pet care is our passion! The team at Friendship is happy to help you with the care of your pet. Each team member has an important role in caring for your family’s best friend. As our Hospital Manager, Gail strives to make life at Friendship Hospital for Animals a little easier for everyone, from our clients to our staff. She considers her position here as her “dream job” combining her love of animals with her skills in business management and organization. A Fort Collins native, Gail enjoys spending her off time outdoors with her husband doing home improvement projects or just relaxing. On the weekends, she competes in both dog agility and confirmation with her Australian Shepherds; Cayenne, Seger, Vixen and SaShay. Gail is thrilled to a part of the Friendship Hospital team. My husband and I moved to Colorado in September 2015 from Northern New Jersey where I managed an indoor rock climbing facility. I am compassionate for animals and their welfare. I have been a responsible pet owner to our 21 year old cat named Amanda, an amazing beagle named Rudy, and a red-eared slider (turtle) named Tommy. I volunteer at several organizations in Fort Collins including; Animal House and a therapeutic horseback riding program. I’m an avid rock climber and enjoy hiking, camping, and taking my neighbor’s miniature schnauzer for walks around the neighborhood. I am proud to join the outstanding team of dedicated, caring and knowledgeable professionals at Friendship Hospital for Animals. I am originally from upstate New York but my true home is in Colorado. I am currently attending Front Range Community College to obtain my Associate Degree in Veterinary Technology. I've always had a passion for animals and have an ever growing animal family. I may be a bit of crazy cat lady, I currently have five cats that rule my life: Yeti, Gaz, Freya, Lenore & Julius. I also have a love for reptiles and currently have a California King snake named Hannibal, a ball python named Clarice and a crested gecko named Zero. When I'm not working or tending to my mini-zoo, I can generally be found reading, playing video games, or watching movies with my husband. Being a part of the Friendship Hospital for Animals family gives me the unique chance to meet new people and their fur-kiddos every day, all while furthering my knowledge in the veterinary field! 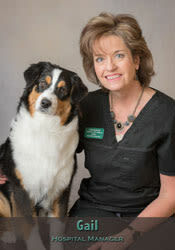 My name is Michelle and I have been working in the veterinary field since 2005. While I am a Colorado native, I have lived and worked in veterinary hospitals in both Nevada and Texas. I am currently pursuing a master’s degree in public health at CSU where my focus and passion is in zoonotic disease prevention. I love to learn new things and appreciate that Friendship Hospital for Animals encourages continuing education. My husband Victor and I are owned by two amazing dogs, Brielle (a Poodle mix) and Gus (a Jack Russell mix). When I am not busy working or studying, I enjoy spending time with my goofy husband and our pups, traveling with family, reading, and watching movies. Joining the team at Friendship Hospital for Animals has been a blessing as all of the staff are truly dedicated to the health and well-being of each and every critter that enters the door! Hi, my name is Raven. I have lived in Colorado basically my entire life, and have always had animals around. I currently have two cats: Newt "Scamander", a wily baby who gets into all sorts of trouble, and Ski Boots, a loveable food addict who should definitely be on a diet. I first decided that I wanted to be a veterinarian at the young age of three, and I haven’t given up on that dream yet! I am a current student at Colorado State University, studying Biomedical Sciences and Zoology. After getting my undergrad I will be applying to the veterinary program at CSU. I am so proud to be a part of such a wonderful team, and I love seeing all of the fur-babies that come in. I often get called the “Swiss army knife” of the Friendship team because I can be found both in the back helping the technicians, or up front assisting our lovely clients! When I’m not working, I enjoy doing yoga, reading, or cuddling up with my cats while I’m studying. I have been a veterinary technician since 2010 and have enjoyed every minute! I have worked with animals in a medical setting of all shapes and sizes. I have completed advanced training in anesthesia and dentistry and continue to use those skills here at Friendship Hospital for Animals. In my free time I enjoy being active and outdoors with my husband and our two sons. I also love playing ball with my red Australian Cattle Dog (Huck) and snuggling up to my kitty (Tsavo) and Husky mix (Sauza). I came to Friendship Hospital for Animals in 2012 as a Certified Veterinary Technician and have continued to love working in an environment where the patient and their guardians come first!" My name is Lara Fetterolf. I have been a Certified Veterinary Technician (CVT) since 2010 and have worked at Friendship Hospital for Animals (FHA) since 2012. Helping animals has always been my passion and giving them the top-notch care as we do here at FHA is very important to me. As an AAHA accredited hospital, we are held to the highest level of veterinary medical standards and providing that level of compassionate care for every client gives me a sense of purpose and fills my heart. I can’t image doing anything else! I am a true “cat person” and have two senior cats that I’ve loved since the day they were born. My heart also holds special room for dogs and hope to include one in my family when the time is right. I look forward to working with you and your pets. I have been working as a vet tech for 8 years. I graduated with an Associates degree in veterinary technology from Colorado Mountain College (Glenwood) and Front Range Community College in 2008. My favorite moments are hiking with my doggy and human family! My border collie (Atlantis) always keeps me moving, and my Chihuahua (Bisbee) and Pomeranian (Blitz) make great weights to carry on your back!! To relax I enjoy playing board games with family and friends. I am so excited to join the “Friendship” team because they are always striving for the best and maintain such a high standard of patient care! Hi, my name is Alexis. I have worked in the veterinary field since 2012. Caring for animals has been my passion for as long as I can remember. My special interests are; senior care, preventative care, behavior and rescue. I am thrilled to be apart of the Friendship team where I can put my passion to work! I am a Colorado native and have enjoyed every minute! I love spending time with my 2 dogs, a Golden Retriever mix named Milo and a Pit Bull mix named Spyro. In my free time, I enjoy reading, traveling, camping, hiking and spending time with friends and family. I have been a veterinary nurse since 2012, but have always worked with animals. I helped train dog for show and obstacle agility at a very young age. Once old enough I worked at numerous shelters doing anything from just helping with the much needed TLC to behavior rehabilitation. It is due to my experiences that I have a special interest in behavior, neurology, and physical therapy. Eventually I plan on becoming a veterinarian which is why I moved to Colorado. When I am not at the hospital, I enjoy participating in sports; such as archery, martial arts, hiking, and dance. I also love to travel all over the world exploring new places and embracing new cultures. My name is Victor and I began working as a veterinary technician in 2003. I am proud to have many years of experience caring for animals through both rescue and in my professional career. My wife and I currently share our home with two dogs; a Jack Russell mix rescued as heartworm positive dog from a shelter in TX, and a very active and sweet poodle mix. In my spare time, I enjoy spending time with my family, making people laugh and trail running. My most recent running accomplishment was completing a 100-mile race in California. I am very happy to be a part of the friendly team at Friendship Hospital for Animals.